Clarets striker Sam Vokes admits he feels in better shape than before his serious knee injury. The 25-year-old is in line to start today’s home clash with Sheffield Wednesday, looking to add to his goal on the opening day at Leeds United. He is up to speed after missing nine months with a ruptured cruciate knee ligament, returning on Boxing Day last year, and after a full pre-season, he is back in the fold with Wales, and raring to go with Burnley. Vokes said: “You work on things you never really did before in terms of leg strength and things like that to support yourself. “That’s why I think you come out a lot stronger in the end, that you - touch wood - prevent it from happening again. “I think from that side of it Jukes will notice as he goes along, and Barnesy’s doing the same. “It’s a hard one for him (Lukas Jutkiewicz) to go through and unfortunately there have been quite a few of at our club recently. “The staff are always there for advice and support. “It’s a hard thing to go through at this stage of the season with a pre-season under your belt. “But he is the kind of guy who will crack on. “The physio department has been brilliant. “With the likes of Deano and Longy coming back now they can turn around an ACL in good timing. And it’s not just turning it around quickly it’s coming back strong as well. 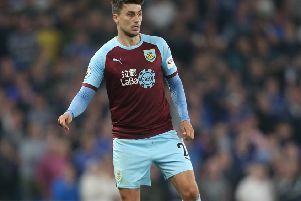 Vokes was the first of five cruciate injury victims in 18 months at the club, with Kevin Long, Dean Marney, Ashley Barnes and Jutkiewicz suffering similar setbacks, but Vokes points to the example of Michael Duff, who is still going strong at the age of 37, eight years after he had the injury footballers dread: “I’ve spoken to Michael a few times about it. “He did it and an even worse one because he did his lateral as well. Vokes hit 20 goals in Burnley’s promotion campaign two seasons ago, with strike partner Danny Ings bagging 26, and he is eager to build a similar understanding with a new strike partner after the departure of Ings to Liverpool. Boss Sean Dyche has brought in Rouwen Hennings, Andre Gray and Chris Long to compete for places up front, and Vokes said: “Andre’s similar to Danny in the way that he plays off the shoulder and he’s a threat in behind and can score goals. If he brings that to the team that would be brilliant. “That’s great for someone like me to play with someone like that. “Hopefully I can build up a similar relationship. “But there’s every type of striker here, which is important. There are only two positions to fight for so the fierce competition there only makes us stronger. “With anyone who comes in there’s always competition for places and there is still that competition there.